Many of the classic starters to be found in most Chinese restaurants or takeaways in the West aren’t necessarily found in restaurants in China! But that doesn’t stop them being yummy. Chop the prawns and mash them with the other topping ingredients. Spread over the slices of bread. Sprinkle with sesame seeds. Cut into quarters. Heat the oil in a wok or deep fryer to a moderate heat and fry the squares, a few at a time, for 3 – 5 minutes or until golden brown. Drain on kitchen towel and serve warm. Traditionally these little parchment-like rolls were served at Chinese New Year to welcome the coming in of Spring. They’re made all over China with many regions having their own distinctive filling. The wrappers can be bought in Chinese grocery shops or supermarkets or you can use filo pastry. Fry the pork in the oil in a wok over a high heat for 1 minute. Add the chopped prawns and stir fry for 30 seconds. Add chicken and vegetables and stir fry for another minute. Stir in the soy sauce, salt, sugar, sesame oil and pepper. Stir in enough cornflour paste to thicken the mixture, which shouldn’t be too runny. Allow to cool and then refrigerate covered. Place about 2 tablespoons of the mixture on a wrapper. Begin to roll up. Paint the edges of the pancake with some of the cornflour paste; about halfway through rolling, fold in the ends. Continue rolling until finished, sealing it all with cornflour paste. Set each one aside until you’ve completed them all. If you prefer, you can oven-bake them. Pre-heat the oven to 220oC, gas mark 7. 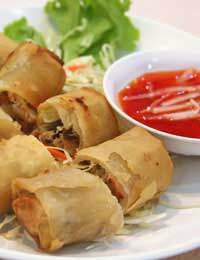 Grease a baking sheet and lay the spring rolls on it. Brush with melted butter or beaten egg and bake for about 30 minutes. Soften the vegetables in oil in a wok. Add the sugar, soy sauce and seasoning to taste. Stir well. For a spicy sauce, mix together 2 tablespoons vinegar, 2 tablespoons sweet chilli sauce, 4 teaspoons light soy sauce and 2 teaspoons sugar. For a sweet and sour sauce, place ½ cup vinegar, ½ cup sugar, ¼ cup sherry and 1 tablespoon soy sauce in a saucepan and bring to the boil. Make a paste of 1 tablespoon cornflour with a little water and add to the saucepan. Stir until the sauce thickens and clears.